When writers like Jules Verne (1828-1905) and artists such as Albert Robida (1848-1926) began dreaming up the first works of science fiction, they were wondering what might be possible based on the fantastic creations of the Victorian era. Most people today aren’t aware of what the daring inventors managed to accomplish, and how inspiring their contrivances were, leading to ever greater achievements. 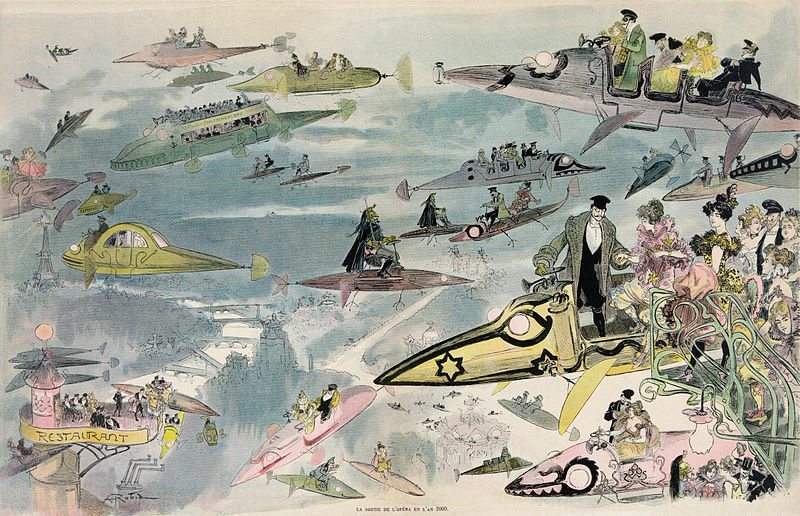 Sortie de l’opéra en l’an 2000 (Leaving the opera in the year 2000), by Albert Robida, 1882. Nowadays, the popular sci-fi/fantasy genre of steampunk looks back, imagining the world if we had retained iron, brass, and leather as our choice building materials, and steam as the source of locomotion. Some steampunk authors stick closely to history, others create a bizarre alternative world, while many write somewhere in between, but all should give a nod of thanks to the brilliant inventors of the 1800s. It was the work of these craftsmen and dreamers who took the rough technology of the industrial revolution and created things of wonder. This article will reveal a small portion of those incredible inventions. I will not go into depth; you may take the information and explore further as curiosity compels you. Two drawings of Goldsworthy Gurney’s steam carriage. Sir Goldsworthy Gurney (1793–1875) was a British gentleman scientist, chemist, inventor, surgeon, architect, and builder. Gurney ran a London to Bath steam carriage service starting in 1829, averaging 14 mph (22.5 km), but was put out of business by unfair tolls and the railway. The public were also afraid of sitting atop a boiler; there were several explosions with fatalities during this era, which the newspapers sensationalized. All technological advancements also faced the wrath of the lingering Luddites, a working-class movement of discontent that started with textile artisans and spread to agricultural labourers, fighting back against the industrial revolution, who attacked and damaged Gurney’s carriages on several occasions. Gurney’s steam drag, circa 1832. Gurney then designed a smaller version, which he called a steam drag, built to pull carriages behind. He is probably the most famous “locomotionalist” of the early 1800s. There were dozens, some of whom built machines superior to his, but many lacked funding. Steam carriages were all the rage, then Parliament passed unfair laws setting speed limits at 2 mph (3.2 km) and requiring an attendant to walk ahead waving a red flag. I have previously posted an article about steam power where I mentioned Gurney that might interest you. Probably the most successful late Victorian steam powered carriage inventor was Amédée Bollée (1844-1917), who built several models in France that carried 6 to 12 passengers at speeds up to 37 mph (60 km). Promotional artwork of the Aerial Steam Carriage Company. Mechanically inclined dreamers started turning their eyes skyward. Balloons were already a popular diversion, but powered manoeuvrable flight became the goal. The Aerial Transit Company was incorporated in 1843 in England, by a team of inventors hoping to raise money to construct a flying machine. Their first creation lacked the required power to get airborne. William Samuel Henson (1812-88) built a scale model of his design, which made one hop as it lifted off its guide wire. Between 1844 and 1847 attempts were made to fly small models, and a larger version with a 20-foot (6.1 m) wing span, but without success. Then, in 1848, they crafted a model that flew for small distances within an empty warehouse. 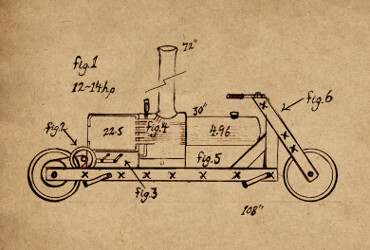 The inventors hoped that their machine would achieve speeds up to 50 mph (80 km), and carry 10–12 passengers distances of 1,000 miles (1,600 km). Despite their best efforts, and huge advancements in remarkable lightweight steam engines, they failed to find the needed investors. 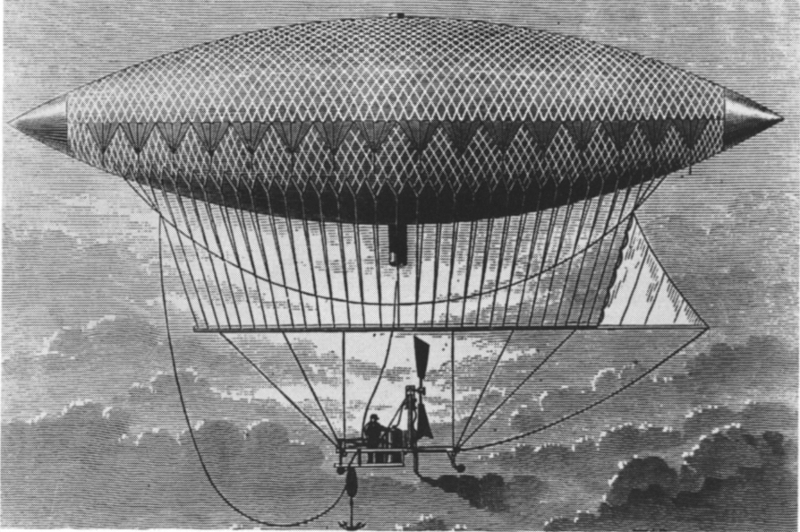 The Giffard Dirigible, flying from Paris to Trappes, 1852. Meanwhile, in France, an engineer named Henri Giffard (1825-82) was leading the way in les ballons dirigeable, French for directable balloons, and from which English adapted the word dirigible. In 1852, Giffard’s airship made the first recorded successful powered and steerable flight. The intrepid inventor flew his machine from the Paris Hippodrome to Trappes, a distance of 17 miles (27 km), in roughly 3 hours. The craft proved manoeuvrable, making many navigational turns and performing circles, but the engine wasn’t powerful enough to fly against the wind and failed to make a return journey. The balloon was 144 feet long (44 m), hydrogen filled, and highly flammable, so the engine exhaust was diverted downwards by a long pipe. The engine produced 3 hp, drove a propeller, and top speed of the dirigible was 6 mph (9 km). 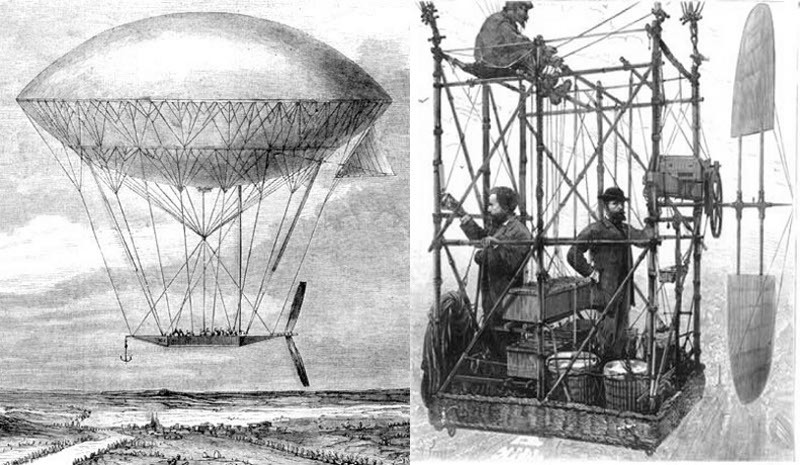 Dirigibles by Dupuy de Lôme 1872, and Tissandier 1883. Henri Dupuy de Lôme (1816-85) and Paul Haenlein (1835-1905) followed up in 1872, the latter using an internal combustion engine running on the coal gas used to inflate the balloon, and in 1883 Gaston Tissandier (1843-99) fit an electric motor to an airship and achieved electric-powered flight. Advances were made decade after decade, observation balloons were used in warfare, and by the Edwardian era the great airships were travelling the globe, Count Ferdinand Graf von Zeppelin (1838-1917) guiding the developments. Brandtaucher (Fire-diver) 1850, and the USS Alligator 1863. Other inventors were thinking about exploring the ocean depths, and the stealth that an underwater craft would provide. 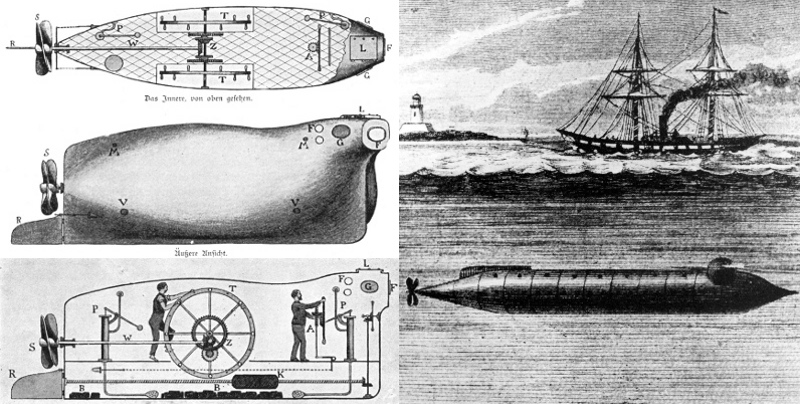 Submersibles went back to the 1600s, but it was the industrial might of the mid 1800s that provided the technology required to build practical machines. Boats that could dive below the waves attracted military interests, and were immediately adapted for a combat role. It was a time when warfare depended upon a strong naval contingent, for transportation and fire-power. The Brandtaucher (Fire-diver) was designed by a Bavarian cavalryman, Wilhelm Bauer (1822-75), who witnessed the Danish blockade of Germany during the First Schleswig War (1848-51) . He was also an engineer and inventor, and working with a Kiel based manufacturing firm created a hand-powered submersible that could approach enemy craft, affix an electrically fired mine to its hull, then slip away, igniting the mine from a safe distance. This technique was behind the creation of the Alligator (1863), the Hunley (1864), and the Explorer (1865). All these crafts were unstable and slow, relying on the crewmen to produce something like 2 to 4 knots, and had crude air purifiers. However, the inventors were looking for ways to power their crafts with various mechanical propulsion systems, and to improve stability, reliability, and armaments. Le Plongeur 1863, and Ictineo II 1864. The French were first with a machine powered craft, Le Plongeur (The Diver), launched in 1863, designed by Siméon Bourgeois (1815-87). It used a compressed-air driven engine that produced 80 hp and maintained speeds up to 4 knots, had a battering ram and electrically fired torpedoes. Poor range was its biggest weakness, only 5 nautical miles (9 km), requiring a support ship to follow it everywhere. A good example of science guiding invention can be found in Narcis Monturiol i Estarriol (1819-85), a Spaniard, whose aim was to craft a safe coral harvester. He was an intellectual, scholar, artist, engineer, and inventor, and is credited with building the first air independent engine driven submersible craft. He studied all the available information on submersibles, and researched other related sciences before building his fish-ship, the Ictineo I in 1859, and making great improvements with the Ictineo II in 1864. The Spanish Navy pledged support, but then withdrew, leaving Monturiol poorly funded. His craft could remain submerged for 7 hours (a chemical reaction providing heat and oxygen), dove to 98 ft (30 m), and averaged 4.5 knots when travelling on the surface. Whitworth rifled breech-loaded cannon 1855, and two examples of projectiles. Not all inventors were concentrating on locomotion. Advancements were being made in every walk of life, some ignored, others immediately popular. Pneumatic tyres were originally created by R.W. Thomson (1822-73) in 1846, but they weren’t accepted until the 1880s. Isaac Singer (1811-75) improved the sewing machine in 1856, and it was heralded as a wonder of the modern age. Sir Joseph Whitworth (1803-87), who I included in my article on military rifles, fabricated breech-loading cannon in the early 1850s that made other artillery pieces look like pea shooters. His 1855 model, a rifled 12 pounder (5.75 kg), fired a twisted bullet-shaped projectile up to 6 miles (10 km) with consistent accuracy; at short range it was utterly devastating. He also produced a 6 pounder (2.7 kg) model. The British Army rejected them. If the artillery at the Siege of Sevastopol (1854-55) had been armed with Whitworth’s cannon it probably would have been over in a matter of days. As it turned out, the weapons weren’t used until the American Civil War (1861-65) in limited numbers, when the first machine guns also appeared. Ironclad battle ships unleash a savage bombardment, Battle of Fort Hindman 1863, and a Gatling gun patent drawing 1865. It’s dismaying how many times amazing inventions were dreamed up, only to fail due to lack of funding, then built much later when the genius of a contraption or gadget was recognised, the original creator often receiving nothing for their ideas. It does seem advancements are often driven by military requirements, and kept secret for covert purposes, the general public only learning decades later of the incredible technology that was used by elite soldiers and clandestine operatives. Kate Tattersall Adventures, while not steampunk, does include the cutting edge science and machinery that was available in the mid 1800s. Kate’s brother, Jack Beaufort, was employed by the British government due to his genius as an inventor. As early as the summer of 1839, when Kate was five years old, he started including her in his experiments while collaborating with other gentlemen scientists of the time. Summer of 1842 he managed to get her briefly airborne in a glider pulled by an enormous kite, but then she ran off course, rolled down a hill, and crashed in a muddy pond. In 1847, one of Jack’s experimental pistols shattered while Kate was test firing it, tearing open her right thumb and palm. Jack provided the weapons and devices that gave the operatives an upper hand while carrying out their taskings. Most of what he built wouldn’t seem fantastic today, but at the time his creations were brilliant, and gave a huge advantage to the British clandestine operatives. 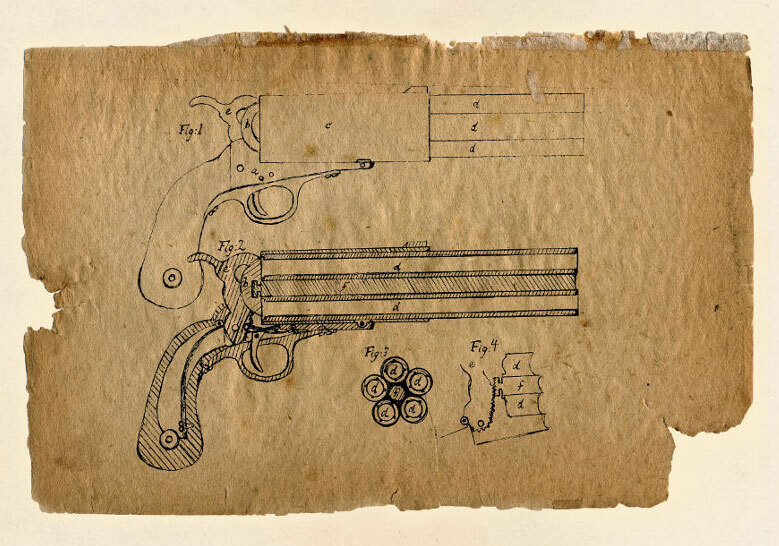 This is a particularly fine drawing of a five barrel pistol. It is similar to what patent drawings were done like in the era. This may be the model Kate carried on her adventure in India 1849, along with a little simpler version she had in China. This revolver is particularly innovative because it appears to use rim fire cartridges, loaded at the rear, the barrels hinging open. Before journeying to the Far East in May 1849, Kate suggested to her brother that he should build a “steam powered velocipede” which would be able to sustain a gallop speed for long distances. The first true road test of such a machine was carried out in the Spring of 1850, Kate taking the role of test pilot. Although it was primitive, the machine proved a success, and figures prominently in an early adventure, and an improved model later when Kate posed as a gypsy in France. I don’t want to give too much away, but you might like to know that Jack attended Giffard’s airship demonstration in 1852, and he was also particularly interested in submersibles; Lord Palmerston recognised the value of such “infernal contraptions” for military applications. I like your blog very much. Suddenly I want to try ballooning. I love steampunk. I’m going to read more about the early inventors. Thanks. I’m astounded by the risk the inventors were willing to take, and how imaginative they were for the tools and fabrication abilities of the times. Thanks for posting this. I love steampunk! This article is fantastic! The Victorians were brilliant! There should be more of the real history in steampunk novels. It’s gotten too fantasy and not enough true. 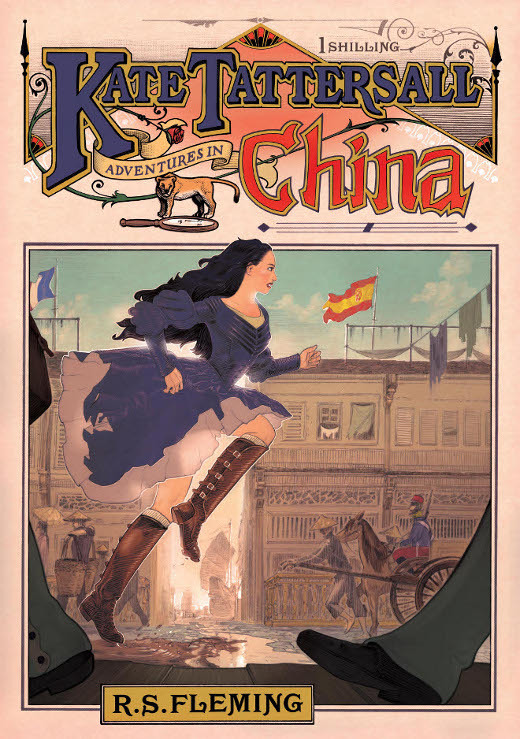 Kate Tattersall Adventures is a nice historical story with the best of Victorian science and invention. As an amatuer historian, I am always fascinated to learn about the little-known, often obsure and “forgotten” FACTS of history. It’s drives me NUTS when people say, ” I don’t like Science Fiction because it isn’t real”! Today’s “science fiction” is tomorrow’s “Science FACT”.